Olympic medallists Kelly Sotherton, Jason Gardener and Iwan Thomas are to step up and take on pacer roles during this year’s Simplyhealth Great Run Series. The trio will go up against each other in the Duracell Bunny Challenge as they become Duracell Bunny pacers to help thousands of runners go further for longer. As the latest runners to don the famous Duracell Running Bunny ears, the three former athletes will compete at races throughout the series of mass participation events that began in 1981 with the world famous Great North Run. Renowned for their prowess over short and middle distances, the pacers will be tasked with running further than they ever did during their elite careers. As well as taking on distances of 10km, 10 miles and the half-marathon, the trio will also compete against each other to see who can get closest to their allocated pacing time at their respective events. Birmingham-based three-time Olympic bronze medallist Sotherton will kick start the ‘Duracell Bunny Challenge’ at the Simplyhealth Great Birmingham 10km on Sunday. Then former sprinter Gardener, now president of UK Athletics, will be tasked with going from 100m to 10,000m by becoming a pacer at the Simplyhealth Great Manchester Run on May 28, marking a return to the city 15 years after his Commonwealth Games gold medal-winning triumph there. British 400m record-holder Thomas will take on the iconic Simplyhealth Great North Run in September and the 10-mile Simplyhealth Great South Run in October, the latter being close to his home on the south coast. The Duracell Bunny pacers have been a cornerstone of series sponsor Duracell’s campaign since partnering with the Simplyhealth Great Run Series in 2016, with more than 100 individuals performing the role last year – including Ryan McLeod (pictured), son of the first winner of the Great North Run, Mike McLeod, for the first time ever at the Simplyhealth Great North Run. Brendan Foster, Olympic bronze medallist and founder of the Simplyhealth Great Run Series, said: “It’s fantastic to see the Duracell Bunny pacers continuing into the series this year, and fitting that Kelly, Jason and Iwan are going to be helping inspire other runners while taking on the ‘Duracell Bunny Challenge’ to go for longer than they’re used to. Sotherton said: “It’s a great honour to be pacing during this year’s Great Birmingham 10km and taking on the ‘Duracell Bunny Challenge’ in my home town makes it even more special. While 800m is the longest distance I used to run in the heptathlon, I’m confident about going for longer at the Birmingham 10km and I hope the other guys can manage to do the same. 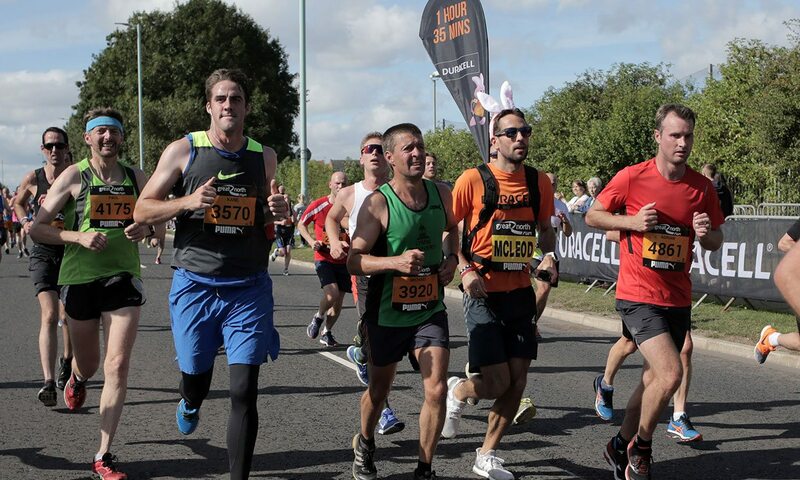 As well as providing the pacers to help runners maximise their own performance, Duracell will this year continue to draw on the power of support by helping spectators cheer on their friends and family using the Duracell #PowerBoards. These customisable boards will be available at the Simplyhealth Great Birmingham 10k, the Simplyhealth Great Manchester Run, the Simplyhealth Great North Run, the Simplyhealth Great Birmingham Half Marathon and the Simplyhealth Great South Run, and will allow fans to write their own personalised messages for runners as they go past.